Catch is, therefore, starting a 'Meet the Voter' series to capture what different impact groups in the poll-bound states are feeling. This is true insight into the upcoming assembly elections: up-close and hyper-personal. 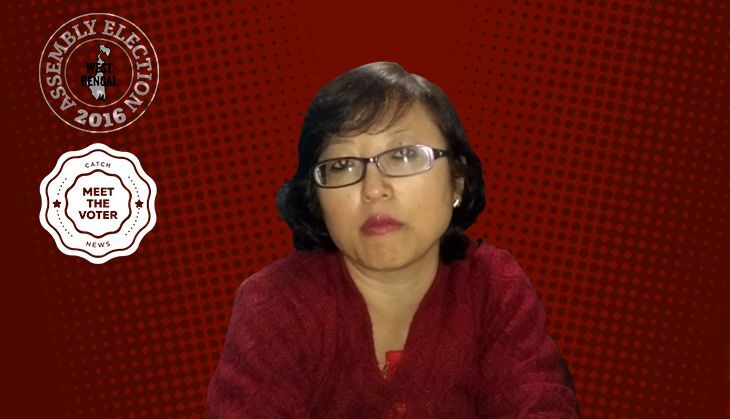 Anukampa Subba is a professor of English at the Kalimpong Government College. She has lived in Kalimpong all her life, and has seen the town transform from an underdeveloped hill town to one of the main tourist destinations in West Bengal. "In the past five years, there has been some form of development in terms of construction, education, health, and improving the overall infrastructure in the town. But in the name of development, Mamata Banerjee has started various development boards for different communities in the hills - for instance, Lepchas, Bhutias, Tamangs etc. But whether this move is development in the true sense, I cannot say," she says. Anukampa feels that starting development boards for different communities in the hills is a move to divide people. "People are so hungry for any form of development, employment and basic amenities that they are ready to grasp whatever they are given, especially when they are quite backward compared to the mainstream population in the rest of the state," she says. "When certain sections of the society get preferential treatment, it leaves a bad taste in the mouths of the sections that are not getting these benefits. Largely, the population in the hills are Hindus and Buddhists, so when one community gets certain amenities and another doesn't, it creates a divide between people. This is a truly dangerous thing." Anukampa says the involvement of the state government in the administration of the hills is not something that people trust. "The Gorkhaland Territorial Administration (GTA) is an experiment. It is a distraction by the state government from the appeal of a separate state. The GTA hasn't been given full powers, nor do we know what will happen if it is given full powers. The state government is very much involved in the running of the GTA, in spite of calling it an autonomous body," Anukampa feels. This is precisely why Anukampa doesn't want TMC-backed candidates to win in the hills. "We do not want the presence of TMC here, because of the kind of politics they have played. They have only tried to divide the people and weaken the Gorkhaland movement. It boils down to intentions, and their intentions are quite clear. They want to immobilise the people and, basically, 'rule' them. There is no trust." Did Kapil Sharma just compare 'intolerance' with 'baba ji ka thullu'? READ NEXT >> Did Kapil Sharma just compare 'intolerance' with 'baba ji ka thullu'?